Cellular respiration, the making of ATP by mitochondria, is the last of a four-part sequence of processes related to the body’s treatment and use of oxygen. The first is breathing, which consists of inhaling (inspiration) and exhaling (expiration). Inhaling gets the oxygen into the lungs. Gases are exchanged between the blood and the lungs; oxygen goes into the blood and carbon dioxide comes out, a process called external respiration. This is contrasted to internal respiration, which is gas exchange between the blood and tissues in order to deliver oxygen to cells and remove carbon dioxide. Once the cells have the oxygen, their mitochondria conduct cellular respiration, producing CO2 as a waste product that must be excreted. The Respiratory System biology study guide unit deals thoroughly with the first three of these processes—those that transport oxygen to cells for cellular respiration. 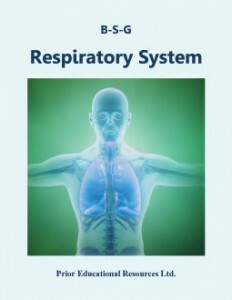 Respiratory System is excerpted from our Biology 12 Study Guide, which is the sixth edition of a student study guide written to match the curriculum of British Columbia. The concepts presented are applicable to the biology curricula of other educational jurisdictions as well.